Last week in Making Things, Part 1 we looked at the forces that can break things: bending, compression & tension, and torsion. As we said, as a general rule, a given material is likely to be strongest in compression or tension, rather than in bending. We finished off by looking at this trailing rear suspension arm, one that’s to be used on a lightweight, small vehicle. The arm primarily has the forces shown by the yellow arrows acting within it - the upper arm (1) is in compression, the arm leading to the suspension bush (2) is in tension, and the gusset panel (3) is in tension. All good! 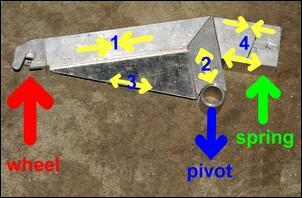 However, the spring actuating lever (4) is in bending – not so good. However, the latter bending component is catered for by the use of a deeper section rectangular tube. When the plank is subjected to the downwards load, the bottom fibres are in tension and the upper fibres are in compression, as shown by the yellow arrows. 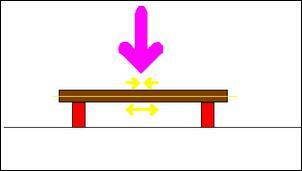 But what about the fibres along the centreline of the plank (yellow line)? There, the wood is neither subject to bending nor to compression – it’s basically doing bloody nothing to withstand the forces. 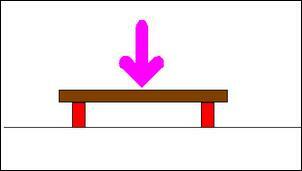 In fact, you can remove this timber without it making much difference to the strength of the plank. 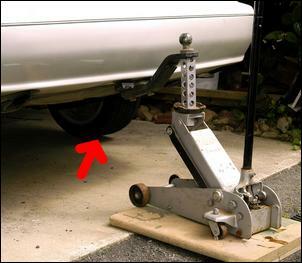 Here’s that trailing suspension arm again... except this time it’s got a few holes in it! The holes look almost random, but let’s take their location step by step. Firstly, the gusset panel (3) is being subjected to tension. In fact, it’s along it lowest edge where the greatest tension is – the panel could be replaced with just a wire that follows the same path as the bottom edge of the gusset. Therefore, the material in the middle of this sheet aluminium panel doesn’t really need to be there, and can be removed by having holes drilled in it. Next, the main part of the arm (1) is being subjected mostly to compression, although if the gusset moves at all there will be some bending too. So the material along the centrelines of each of the four faces can be removed. The same applies to (2). (4) is subjected to high bending loads, but again as we know the material along its centreline isn’t doing much, so out again with the holesaw. Clearly the holes will weaken the structure to some extent, but the important point to note is that removing material in this strategic manner results in a much lighter assembly without anywhere near the loss of strength you might expect with the reduced weight. So how much less weight then? In this assembly, where the mount for the wheel (far left) and the aluminium tube for the bush (bottom right) could not be lightened, the overall weight dropped by about 25 per cent. Looking at just the members that were drilled, the mass reduction was something like 30 per cent. Almost forgotten now, or seen simply as huge hydrogen-fuelled disasters in the shape of the Hindenburg, the lighter-than-air aircraft of the 1920s and 1930s represented state of the art design in aluminium frames. Despite their enormous size (larger than many ocean liners of the time), the lifting capacity of the airships was quite limited. As a result, extreme measures were taken to lighten everything inside the craft. Dividing walls of the cabins were often made of cloth, drinking water was low in volume – and holes were drilled everywhere! 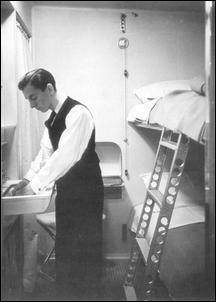 This photo shows even the ladders used to get to the top bunk were super lightweight. The ladder is made from aluminium channel (or duralumin as this grade of alloy was then called). Each hole is flanged for additional strength and except where the treads of the ladder are located, the holes are incredibly close together. And not only were the ladders made like this – much of the airship framework also used holes to lighten the structure without overly reducing strength. Holes can be seen on many craft – including aluminium monocoque race cars – but the pre-WWII airship design represents the approach taken to its extreme. Incidentally, at the time, airships were by far the kings of the sky, especially for intercontinental travel. So how strong is a piece of square section tube with a heap of holes in it? Proving that in full engineering detail takes some techniques that we’re not going to cover here, but let’s do two simple tests. First, the specs of the aluminium tube: 40 x 40 x 3mm, with 22mm diameter holes. The length of the piece was 185mm and its mass 150g. (And 150g is nearly nothing – like, a metal teaspoon weighs about the same!) The aluminium was just plain ol’ retail aluminium – nothing special. The first test was in compression. 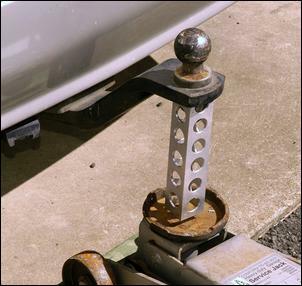 The heaviest handy thing I have around is a car (a Lexus LS400) and the test piece was placed vertically between a hydraulic jack and the underside of the towbar. 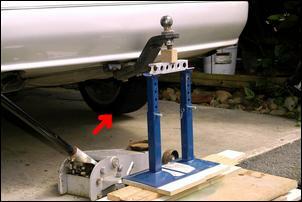 Pump the jack handle and the tube gets compressed as the weight of the car is lifted. Incredibly, this section of lightweight, drilled square aluminium tube can support about half the weight of the car! (Note the rear wheels off the ground.) Ahh, but what about in bending? That’s a much tougher ask. 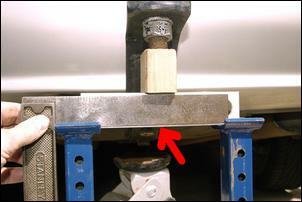 ...the rear weight of the car rested fully on the test piece. Incredibly, again the 150g aluminium tube supported the load! (Again note the rear wheels off the ground.) But was the tube bending like a banana? Nope! 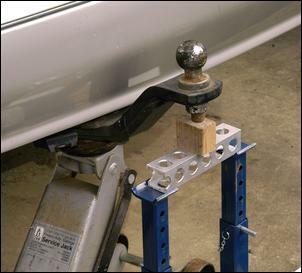 As this straight edge shows, the deflection wasn’t even easily measurable.... Also check out how little of the tube is supported on each of the jack-stands! So how much weight does it take to break (or bend beyond its elastic limits) this piece of tube? I don’t know, but I do know that in the application in which I am using it, it has waaaay more strength than I need! So remember that holes don’t have to mean weakness... while their presence always makes structures lighter. Making a new airbox intake - but did it improve performance?